Our guest blogger is Embry Burrus, Assistant Clinical Professor, Department of Communication Disorders, Auburn University, and author of “Mama and Margaret”. My name is Embry Burrus, and my big sister, Margaret is one of the funniest, coolest people I know. In fact, she is one of my most favorite people to hang out with—she loves to have fun, and is always ready for a new adventure – no matter what it is, Margaret’s up for it! She is also one of the most loving, kind and non-judgmental people I know, too. She shows me everyday what unconditional love truly is. She is the best sister anyone could hope for; oh, and by the way, she has Down syndrome. That used to be the first thing I would tell people about Margaret, as if I needed to “temper” whatever I said about her with those words: She has Down syndrome. But now, I realize that Down syndrome does not define her at all. 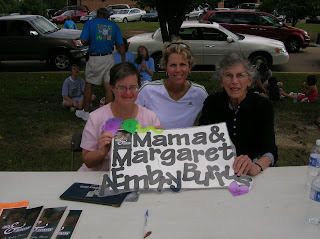 People don’t like to meet Margaret and hang out with her because she is all of those things and she has Down syndrome; they like to meet her and hang out with her because she is all of those things, period. What an awakening that has been for me—one of the many things I’ve learned from being Margaret’s sister. If you’d like to meet both of them and learn more about our family, please visit my website at: www.aeburrus.com. Looking at this picture, I see innocence, openness, acceptance, wonderment. I see three beautiful people. What do you see?